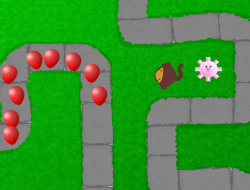 Your job in this famous strategy game is to make an impenetrable defense so all the balloons will not be able to cross over and reach the exit. To do this you will have to hire monkeys that constantly throw darts at any balloon that is in their range. Keep investing in them as the bloons will also come in increasing numbers and with higher speeds. Choose a difficulty you think you can win at and you will surely have a fun time with this tower defense game. Do not let them cross over or your score will be greatly diminished by the escapees. Use the mouse to place turrets and use skills. Bloons TD 0.00 between 0 and 10 based on 0 votes.